Plan a fun Halloween play date with the preschool set! Nothing truly scary for this age. I’m a fan of decorations, snacks and games centered around scarecrows and spiders, pumpkins and cats for little ones. Parties should be simple, quick and colorful with the emphasis on the fun activities and playing with friends. 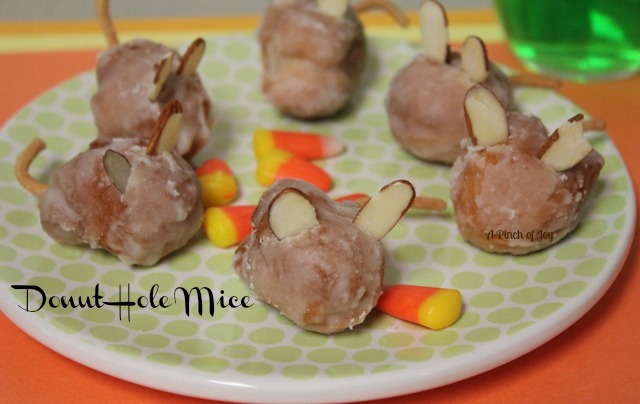 These cute – and yummy—little mice are made with three simple ingredients. Glazed donut holes, chow mein noodles for the tail and sliced almonds for the ears. 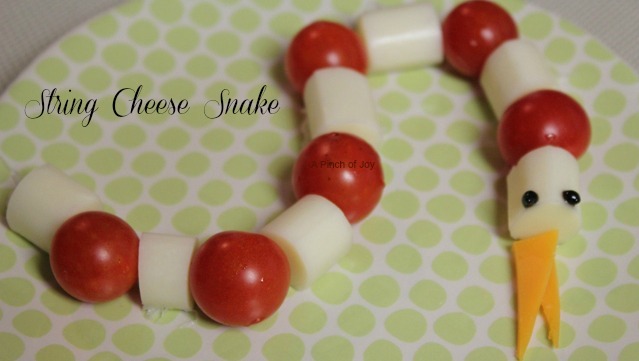 Sammy Snake is made from pieces of string cheese alternating with cherry tomatoes. He has a cheddar slice tongue and eyes from black frosting gel. Instead of cherry tomatoes, use chunks of ham, mini crackers, carrot or green pepper slices. 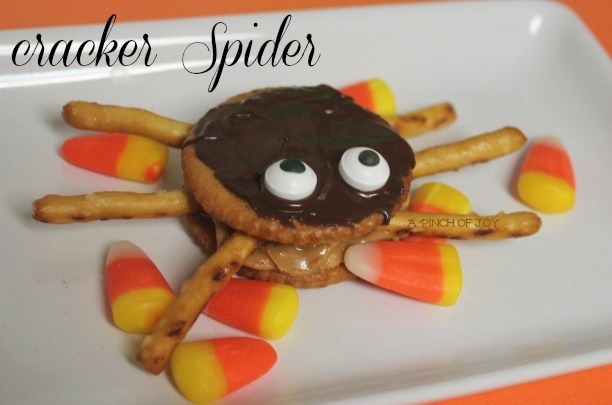 Spiders made from round snack crackers are quick and easy. Use Ritz crackers as they are less likely to crumble as you work with them than are other brands (at least the ones I’ve tried!) Put 6-10 crackers on a microwave safe plate and place a candy melt wafer on top of each cracker. Microwave on 50% power for about one minute. Spread the melted candy over each cracker. Add eyes. I used candy eyes from Wilton, but mini M&Ms or other little colorful candies will also work. Let cool and harden. On a second set of crackers put a generous teaspoonful of peanut butter in the center of each. Add six thin pretzel sticks to make legs. (Yes, spiders have eight legs —but the cracker only holds six without looking weird!) Set chocolate covered cracker on top of peanut butter and push down gently. You may need to add more peanut butter to the bottom of the chocolate covered cracker to make it fit over the legs and stick together. If there is a peanut allergy to consider, substitute cream cheese for the filling. Older toddlers can assemble their own spiders as a party activity if chocolate has hardened ahead of time. Decorations are best kept simple. Bright orange tablecloths make the table festive. Large and colorful cutouts from the dollar store or craft store “teacher” section add atmosphere. Friendly pompom spiders are quick and easy decorations to hang from doorways or light fixtures. You can make them different sizes from large to small. Their fuzziness makes them more cuddly than scary! Don’t miss a thing — subscribe by email or RSS feed, follow on facebook or twitter to catch the latest post! If you found this post helpful, please give it a Pin, or Facebook Like. Your support of A Pinch of Joy is greatly appreciated! Thanks for sharing this at Saturday Dishes. What creative and fun Halloween ideas for pre-schoolers. I love how simple they are. I hope you’ll return next week when we feature tailgating recipes. Pinned! Thanks for such a wonderful blog. I’m a fan of decorations. Decorations are best kept simple. Bright orange tablecloths make the table festive. Large and colorful cutouts from the dollar store or craft store “teacher” section add atmosphere. Such cute stuff – love the cracker spider!